Ever wonder what your dog is thinking? What does that look mean? Why are they standing that way? 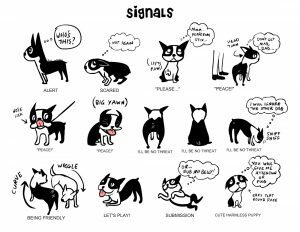 At Pet Care Plus all our staff is trained to read your dogs body language and actions. This translates into one of the safest doggie daycares in Chicago to bring your dog. We are also partnering with Rendy Schuchat of Anything Is PAWZible. Until then here is a fun infographic from Lili Chin that has a fun “cheat sheet” on reading your dog.